A Hill-Sachs lesion is a compression fracture or "dent" of the posterosuperolateral humeral head that occurs in association with anterior instability or dislocation of the glenohumeral joint. It was first described by two radiologists by the name HA Hill and MD Sachs in 1940. This lesion is caused by an anterior shoulder dislocation which causes a humeral head impression fracture. The posterolateral aspect of the humeral head impacts on the anterior glenoid in the dislocated position, causing instability at the glenohumeral joint. The glenohumeral joint is a synovial ball-and-socket diarthroidal joint. It is the articulation between the glenoid of the scapula and the head of the humerus. It is commonly known that the shoulder joint has a loose capsule, making it the most commonly dislocated joint in the human body, of which 90% of these dislocations are anterior. This is a result of the scapular orientation of about 30° anterior to the frontal plane of the body. The humerus is thus anteriorly orientated to the glenoid in the glenohumeral joint. This is a brief overview of the relevant anatomy. 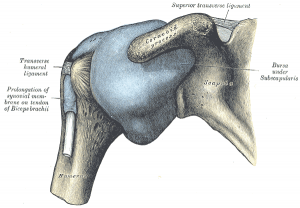 See the page for the glenohumeral joint for detailed information. The glenoid of the scapula articulates with the humeral head to form a ball-and-socket joint. The labrum, a fibrocartilaginous structure, surrounds the glenoid to ensure that there is enough contact between the surface of the glenoid and the humeral head. There is a concavity compression mechanism which plays an important role in the stability of the shoulder. The less contact there is, the higher the risk for dislocations. 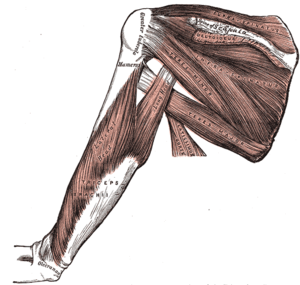 There are eight bursae in the shoulder complex as a result of the high amount of muscles surrounding the shoulder. They ensure a smooth contact between the muscle and the underlying structures. The subacromial bursa is the biggest in the body. 1. Subacromial-subdeltoid bursa; 2. Subscapular recess; 3. Subcoracoid bursa; 4. 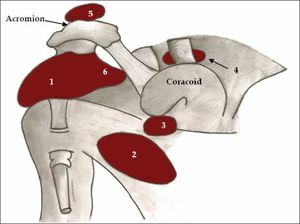 Coracoclavicular bursa; 5. Supra-acromial bursa; 6. Medial extension of subacromial-subdeltoid bursa. The incidence of Hill-Sachs lesions are approximately 40%-90% of all anterior shoulder instability cases, and even as high as 100% in patients with recurrent anterior instability. A study looking at this found Hill-Sachs lesions in 65% of acute dislocations and 93% in patients with recurrent instability. A Hill-Sachs lesion occurs in about 50% of the first-time shoulder dislocations. For people with a shoulder dislocations history (i.e. shoulder instability) humeral head compression fractures are present in most cases. Classification systems are used to describe the amount of damage to the anterior capsule and the labrum, reflected by the depth of the lesion. Higher grade lesions are associated with increased risk of recurrent dislocation. 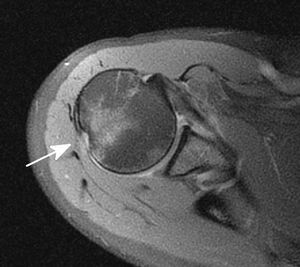 Grade 3: Lesion causes large defect in the subchondral bone. Further classification can be done by looking at the percentage of the defect of humeral head involvement in the compression fracture. The size of the lesion correlates in most cases to the number of previous dislocations. Shoulder dislocation rarely occur isolated. It causes damage to different tissues surrounding the glenohumeral joint, such as ligaments, rotator cuff tendons, joint capsule as well as the bone and cartilage of the humeral head. This occurs when the round humeral head is forcibly impacted on the edge of the glenoid, which causes compression fractures in the humeral head. This forms a dimple structure on the articular surface of the humerus - a Hill-Sachs lesion. This is always caused by dislocation, not only sublaxation. Several studies have shown that when the number of dislocations increases, the incidence and size of Hill-Sachs lesion also increases. It can be a cause of instability and in this case, surgical treatment is considered. Frequently, authors consider that surgical treatment of recurrent shoulder dislocation is indicated when someone had more than five shoulder dislocations. With minimum glenoid bone loss and without significant involvement of the humeral head (<20%), surgical management is not indicated. This instability can be managed conservatively in a mastersling for immobilization for 2-6 weeks, before starting with rehabilitation (see "Physiotherapy management" later on). Management of humeral bone loss (as in Hill-Sachs lesion) can be directed at the restoration of the glenohumeral articular arc with either glenoid-based bone augmentation techniques (most commonly used), humeral-based strategies, or a combination. These strategies include open as well as arthroscopic procedures, depending on the extent of the pathology. . Treating the glenoid defects is often the solution to the glenohumeral instability. CT scans make it possible to reliably asses the location and depth of the humeral lesion. Based on the this, a surgical decision is made. Most commonly, bone from the coracoid process is used as an augment to the antero-inferior glenoid bone loss. By reforming the concavity and width of the glenoid, a Hill-Sachs lesion does not influence the anterior glenoid rim of unstable shoulders. Currently not method of choice, given the related risks and the success rates of more recent procedures. Advantages: Minimal exposure; humeral head remains in the capsule. The non-operative rehabilitation of the unstable shoulder consists about seven key factors. It is important to consider this in the rehabilitation program of the shoulder after a Hill-Sachs lesion. Post-surgical rehabilitation should be guided by the orthopaedic surgeon, and depends on the procedure that was done. A Hill-Sachs lesion is an injury that occurs secondary to an anterior shoulder dislocation. The humeral head ‘collides’ with the anterior part of the glenoid, causing a lesion, bone loss, defect and deformity of the humeral head. This may cause a change loss of range of motion, feelings of instability and pain. A grading system is used based on the amount of bone loss or severity of the humeral head deformity. The incidence of Hill-Sachs lesion in patients with anterior shoulder instability can be as high as 100%. Another pathology secondary to an anterior shoulder dislocation is a Bnkart lesion. This is an injury of the anterior glenoid labrum of the shoulder and often often accompanied by a Hill-Sachs lesion. Conservative treatment is only recommended in cases of small bony defects (<20% Hill-Sachs lesion), in other cases (larger and more significant lesions), surgical treatment is needed. The conservative treatment should be based on strengthening the deltoid, the rotator cuff muscles and scapular stabilizers. ↑ 1.0 1.1 1.2 1.3 1.4 Provencher MT, Frank RM, LeClere LE, Metzger PD, Ryu JJ, Bernhardson A, Romeo AA. The Hill-Sachs lesion: diagnosis, classification, and management. Journal of the American Academy of Orthopaedic Surgeons 2012;20(4):242-52. ↑ 2.0 2.1 2.2 Shoulder Doc. Hill-Sachs Lesion. https://www.shoulderdoc.co.uk/article/1470 (accessed 26/08/2018). ↑ 3.0 3.1 3.2 3.3 3.4 3.5 3.6 3.7 3.8 Provencher M, Rose M, Peace W. Hill-Sachs Injuries of the Shoulder: When are these important and how should I manage them? In: Abrams JS editor. Management of the unstable shoulder: arthroscopic and open repair. Slack Incorporated, 2011.p.235-252. ↑ 4.0 4.1 Castro WHM, Jerosch J, Grossman TV. Examination and diagnosis of musculoskeletal disorders. Georg Thieme Verlag: Germany, 2001. ↑ 5.0 5.1 5.2 Dodson CC, Cordasco FA. Anterior glenohumeral joint dislocations. Orthopedic Clinics of North America 2008;39(4):507-18. ↑ 6.0 6.1 6.2 6.3 Gray’s Anatomy, Anatomy of the human body. 11th edition, 1918. ↑ 7.0 7.1 7.2 Bushnell B, Creighton R, Herring M. The bony apprehension test for instability of the shoulder: a prospective pilot analysis. Arthroscopy 2008:24(9):974-82. ↑ Dutton, M. Orthopaedic: Examination, evaluation, and intervention (2nd ed.). New York: The McGraw-Hill Companies, 2008. ↑ Yiannakopoulos CK, Mataragas E, Antonogiannakis E. A comparison of the spectrum of intra-articular lesions in acute and chronic anterior shoulder instability. Arthroscopy: The Journal of Arthroscopic & Related Surgery 2007;23(9):985-90. ↑ 10.0 10.1 10.2 10.3 10.4 Wiki Radiography. Hill-Sachs and Bankart lesion, http://www.wikiradiography.net/page/Hill-Sachs+and+Bankart+Lesions (accessed 27/08/2018). ↑ 11.0 11.1 11.2 11.3 11.4 11.5 Savoie F, O’Brien M. Management of Hill-Sachs Lesion, International Congress for Joint Reconstruction, 2014. ↑ 12.0 12.1 12.2 Calandra JJ, Baker CL, Uribe J. The incidence of Hill-Sachs lesions in initial anterior shoulder dislocations. Arthroscopy: The Journal of Arthroscopic & Related Surgery 1989;5(4):254-7. ↑ Horst K, Von Harten R, Weber C, Andruszkow H, Pfeifer R, Dienstknecht T, Pape HC. Assessment of coincidence and defect sizes in Bankart and Hill–Sachs lesions after anterior shoulder dislocation: a radiological study. The British journal of radiology 2014;87(1034):20130673. ↑ 14.0 14.1 Widjaja AB, Tran A, Bailey M, Proper S. Correlation between Bankart and Hill‐Sachs lesions in anterior shoulder dislocation. ANZ journal of surgery 2006;76(6):436-8. ↑ Kim DS, Yoon YS, Yi CH. Prevalence comparison of accompanying lesions between primary and recurrent anterior dislocation in the shoulder. The American journal of sports medicine 2010;38(10):2071-6. ↑ 16.0 16.1 16.2 Cetik O, Uslu M, Ozsar BK. The relationship between Hill-Sachs lesion and recurrent anterior shoulder dislocation. Acta orthopaedica belgica 2007;73(2):175-8. ↑ 17.0 17.1 17.2 Cluett J. Hill-Sachs Injury: Damage to the shoulder joint as result of dislocation. Orthopedics, 2013. ↑ 18.0 18.1 18.2 18.3 18.4 Radiopedia. Hill-Sachs lesion. https://radiopaedia.org/articles/hill-sachs-lesion (accessed 27/08/2018). ↑ 19.0 19.1 Omoumi P, Teixeira P, Lecouvet F, Chung CB. Glenohumeral joint instability. Journal of Magnetic Resonance Imaging 2011;33(1):2-16. ↑ 20.0 20.1 Kodali P, Jones MH, Polster J, Miniaci A, Fening SD. Accuracy of measurement of Hill-Sachs lesions with computed tomography. Journal of shoulder and elbow surgery 2011;20(8):1328-34. ↑ 21.0 21.1 Pancione L, Gatti G, Mecozzi B. Diagnosis of Hill-Sachs lesion of the shoulder: comparison between ultrasonography and arthro-CT. Acta Radiologica 1997;38(4):523-6. ↑ Pavic R, Margetic P, Bensic M, Brnadic RL. Diagnostic value of US, MR and MR arthrography in shoulder instability. Injury 2013;44:S26-32. ↑ Cutts S, Prempeh M, Drew S. Anterior shoulder dislocation. The Annals of The Royal College of Surgeons of England 2009;91(1):2-7. ↑ 24.0 24.1 24.2 24.3 Chen AL, Bosco III JA. Glenohumeral bone loss and anterior instability. Bulletin of the NYU hospital for joint diseases 2006 Dec 22;64(3-4):130. ↑ Schroder DT, Provencher MT, Mologne TS, Muldoon MP, Cox JS. The modified Bristow procedure for anterior shoulder instability: 26-year outcomes in Naval Academy midshipmen. The American journal of sports medicine 2006;34(5):778-86. ↑ Hovelius L, Sandström B, Sundgren K, Saebö M. One hundred eighteen Bristow-Latarjet repairs for recurrent anterior dislocation of the shoulder prospectively followed for fifteen years: study I—clinical results. Journal of shoulder and elbow surgery 2004;13(5):509-16. ↑ Wilk KE, Macrina LC, Reinold MM. Non-operative rehabilitation for traumatic and atraumatic glenohumeral instability. North American journal of sports physical therapy 2006;1(1):16.